Artist's concept of the subduction process thought to be occurring on Jupiter's moon Europa, showing how a cold outer portion of Europa's ice shell moved into the warmer shell interior and was ultimately absorbed. A "subsumption band" was created at the surface in the overriding plate, alongside which cryolavas may have erupted. The new results come less than a year after plumes of water vapor were spotted erupting from Europa's south polar region. That find excited astrobiologists a great deal, because it suggested that a robotic probe may be able to sample the moon's subsurface ocean of liquid water at a distance, without even touching down. "There have been a lot of recent exciting discoveries [about Europa]," Kattenhorn said. "All taken together, as NASA starts thinking about future missions, I'm hoping it will be pretty clear: This [Europa] is the obvious choice." Kattenhorn and co-author Louise Prokter, of Johns Hopkins University's Applied Physics Laboratory, studied photos of Europa taken by NASA's Galileo spacecraft, which orbited Jupiter from 1995 until 2003. The researchers used the images to reconstruct the recent geological history of a 52,000-square-mile (134,000 square kilometers) swath of Europa — an area about the size of the state of Alabama. They noticed that the region changed over time, with some surface features becoming mismatched relative to the architecture captured in earlier images. False-color image of Europa’s trailing northern hemisphere, where subduction zones indicative of a system of plate tectonics are thought to exist. "It was very clear that you could reconstruct the original picture simply by moving plates around," Kattenhorn said, comparing the duo's approach to assembling a jigsaw puzzle. Further, there was a gap in this reconstructed picture, as if a large puzzle piece had fallen off the table. In a sense, that's probably what did happen, Kattenhorn said. "In this case, the big chunk had actually moved down underneath the adjacent plate and was forever lost, recycled into the interior" of Europa's ice shell, he said. That chunk was indeed big, about the size of the state of Massachusetts, Kattenhorn added. If the scientists' interpretation — laid out in a study published online today (Sept. 7) in the journal Nature Geoscience— is correct, planetary science textbooks will have to be rewritten. "Plate tectonics has been thought to be unique to our world," Michelle Selvans, of the Smithsonian National Air and Space Museum, wrote in an accompanying "News and Views" piece in the same issue of Nature Geoscience. "Subduction zones, convergent boundaries where one tectonic plate slides under another and is recycled into the Earth's mantle, are unique to plate tectonic systems," Selvans wrote. "Although Mercury, Venus and Marsshow clear signs of tectonic activity, such as systems of thrust faults and rift valleys, none of these rocky planets have been convincingly shown to have a system of moving tectonic plates, either today or in the past." "From my perspective, that's pretty exciting, that we've addressed these two really important questions about Europa," Kattenhorn said. He and Prokter said Europa likely has a system of cold, brittle plates moving around above convecting warmer ice. The mechanisms behind Europan plate tectonics are unclear at the moment, Kattenhorn said, stressing the need for modeling work. But tidal heating generated by the tug of Jupiter's immense gravity, the same phenomenon that keeps Europa's interior ocean from freezing up, may be one of the ultimate drivers, he added. Some scientists think plate tectonics were essential to the rise of life on Earth. For example, the idea goes, the movement of plates replenishes nutrients and helps stabilize the planet's climate by recycling carbon. 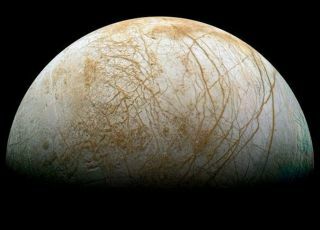 "Perhaps Europa and Earth are even more uniquely similar: It is tempting to note the correlation between the existence of both life and plate tectonics on Earth and wonder if the latter might not be a requirement of the former," she wrote. Europa's ice shell is thought to be 12 to 19 miles (20 to 30 kilometers) thick, and subducting plates likely dive down only a mile so, Kattenhorn said. Subduction, therefore, probably doesn't take any nutrients or other complex molecules from the surface down into the ocean immediately. But this could happen indirectly and over longer periods of time via convection, he added. "As with all convection, what goes up must go down as well," Kattenhorn said. "One can imagine that some of that material may ultimately, just by virtue of being in a convective system, work its way downward. Whether that ultimately comes into contact with the ocean is an important question." And there may be pockets of liquid water within the ice shell relatively close to the surface, perhaps close enough to be reached by a subducting Europan plate, he added. "People who are thinking about habitable environments — certainly not my field of expertise — that would probably be something very interesting for them to think about," Kattenhorn said.